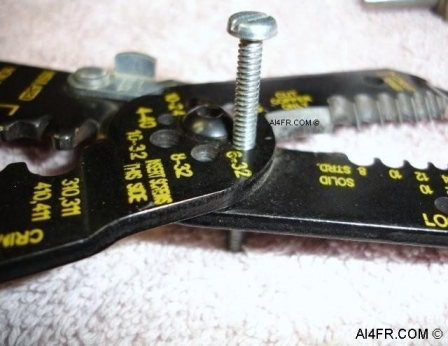 Have you lost that little set screw that holds on your radio knobs or connecting shafts and so on? Or has the screwdriver slot been damaged beyond use? Maybe some one in the past used an Allen wrench instead of a Bristol wrench and now your repair time is going to take that much longer because the hardware store is closed. Well you are in luck as a quick fix to this problem is just moments away and shortly you will be making your very own set screws. The first thing that is needed is to find a screw in your junk box that is of the correct size and has the proper threads. Be careful in this process as the threads inside your radio knob or the junk box screws itself could be either metric or standard. You do not want to force a metric screw into standard threads and vis versa. When trying the fit of that junk box screw into the threads of your radio knob, if it starts to get hard to turn, STOP there and find another screw. Do not force or try to make it fit. All you will end up doing is destroying the soft threads in your radio knob and the best one could hope for after that would be to tap a new set of threads in it. Often, the threads inside of a knob are made out of aluminum or brass and these metals are much softer then a steel screw. The photograph on the right displays the beginning stage of making a set screw that has a diameter of 8 with 32 threads per inch. Please see the text at the bottom of this page for an explanation about these numbers. After finding a screw with the correct threads we now need to find a way to cut it at the proper length. For this job, the easiest way I have found to accomplish this cut is to us a stripper and crimper multi-tool as seen in the picture on the left. Thread the screw through the proper slot as shown in the picture. 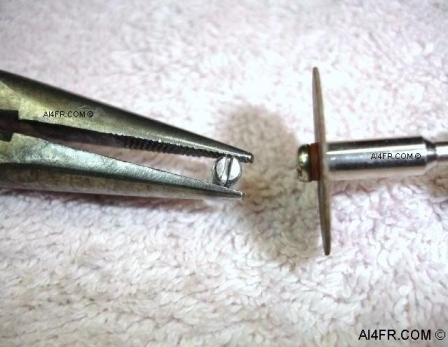 With a quick squeeze, cut the screw at the desired length. 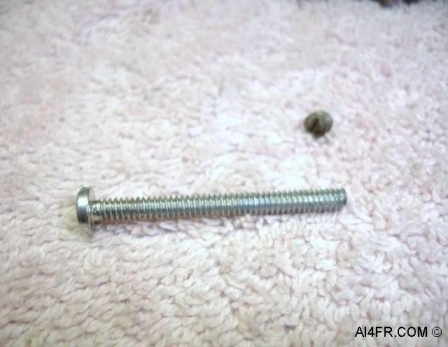 As can be seen in the picture on the left, the set screw that is being made is from a 6-32 size screw. The first number(6) can be translated to the diameter of the screw using a formula and the second number is the number of threads per inch. At the bottom of this article there is an explanation on this formula. 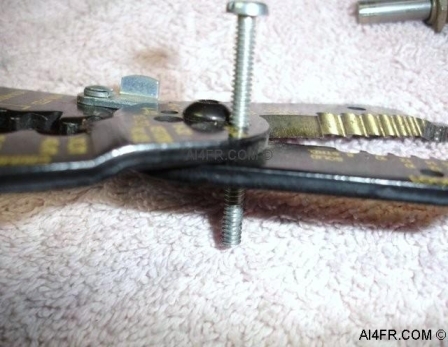 Now that you have your set screw cut to the desired length, it is time to make a slot at one end for the screwdriver. Shown in the picture on the right is our screw with the dremel tool attachment that was used to cut the slot. Yes, one can use a file for cutting the screwdriver slot but I have found that it is a lot easier and faster to do it with the dremel tool. 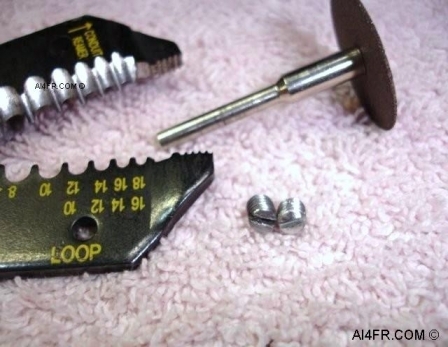 Place our recently made piece of allthread in a vice or pair of pliers and while being careful not to damage the threads, grind a screwdriver slot in the top of it. Some times, it will be necessary to remove any burrs that was left over after cutting our set screw from the junk box screw. The same dremel tool attachment can be used for this as well. That is all there is too it. The total time to produce the set screw after a junk box screw of the proper size has been found is well under 3 minutes. Now that sure is a lot better and cheaper then a trip to the hardware store. Lastly, do not forget to have in place the proper safety measures such as safety glasses, and if possible, return the unused portion of the junk box screw to the junk box, you never know when you will need it again. I have found that the longer I have had a junk box item, the sooner I will need it when I toss it out. Skip the text below if you are not interested in how a machine screw gets its size designation . Machine screws are normally described in terms of 0-80, 2-56, 3-48, 4-40, 5-40, 6-32, 8-32, 10-32, 10-24, etc. up to size 16. The first number, by way of a formula is the diameter and the second number is the number of threads per inch. There is usually a coarse thread and a fine thread that can be found for each size. A fine thread is preferred in thin materials or when greater strength is desired. The machine screw numbering system follows closely to a logarithmic scale where an increase in a screw number size will approximately double the tensile strength of the screw. This screw number is found by the formula d = (# x .013) + .060, where "d" is the nominal diameter. Using this formula, a #10 screw has a diameter of .190" (or 3/16" in practical terms), a #5 screw has a diameter of .125" (1/8"), and so on. The formula applies only for screw thread numbers that are #0 and higher, but does NOT apply to smaller Unified miniature screw thread series. Typically screws smaller than size #0 are supplied in the Unified Miniature Series. The formula for number sizes smaller than size #0 is, d = .060" - (#zerosize x .013) with the zero size being the number of zeros after the first. So a #00 screw would be .047" in diameter, #000 would be .034" in diameter and so on. The number series of machine screws at one time included odd numbers such as 9, 11, 13, and so on and even extended up to #16 or more. But standardization efforts some time in the late 19th and early part of the 20th century reduced the range of these sizes considerably. Now, it is much less common to find machine screws larger than #14, or odd number sizes other than numbers, #1, #3 and #5. 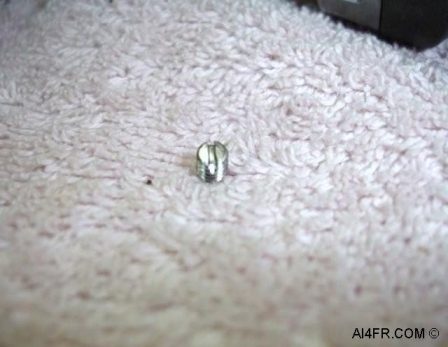 Even though it is possible to find screw sizes #14 and #16, they are not nearly as common as sizes #0 through #12. Sizes starting at a 1/4" diameter and larger are designated as 1/4"-20, 1/4"-28, and so on. In these examples, the first number is giving the diameter in inches and the second number is the number of threads per inch. Most thread sizes can be found in UNC or UC which stands for Unified Coarse Thread, or UNF or UF which stands for Unified Fine Thread.